Launched at Harbour Heights boat ramp at 6:30am yesterday with Dave (stormy). We were going to target boat docks again to see if we could duplicate our efforts from our last trip there. The fog was as thick as pea soup on the river. We went over to work the grassy area and island adjacent to the ramp. The water temp was 80 degrees and the tide was outgoing. I had on the spook jr in bone and Dave was trying something new. It was a DOA chugger head that fits over a CAL shad body rigged with a worm hook. This lure made an incredible sound like a snook exploding on baitfish. I would equate it to a chug bait. We ease up to the point and Dave catches a 19 1/4" snook on the chugger at 6:41am. We see activity up river on this adjacent bank and move towards it. I am working my bait near shore and a good snook explodes on my lure. I set the hook and the fish tail-walks towards the boat and spits my lure. We continue down the bank and fish start crushing baitfish on the surface. I cast out and catch a small jack on the spook at 6:48am. We come back down and fish the island near the ramp. 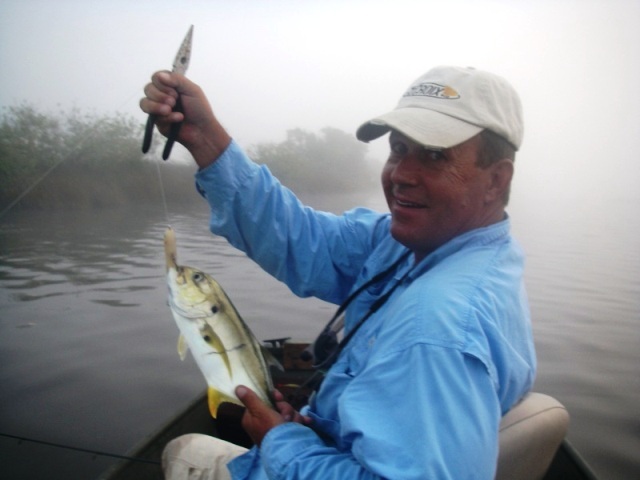 I catch a 19 3/4" snook off the point on the spook jr. at 7:15am. No more strikes so we head over to the south side of the river through the Shell Creek cut. We work two points along the way but nothing. Now working docks, I catch a 15 1/2" snook with the 4" Rip Tide mullet in shadflash color worked on the bottom at 8:56am on the first dock we come to. I pick up a 15 3/4" trout at 9:25 on the same lure next to a dock. Two minutes later a 16" trout succumbs to my offering on the same dock. We move over to the other side of the river to work an island with a mangrove point close by. 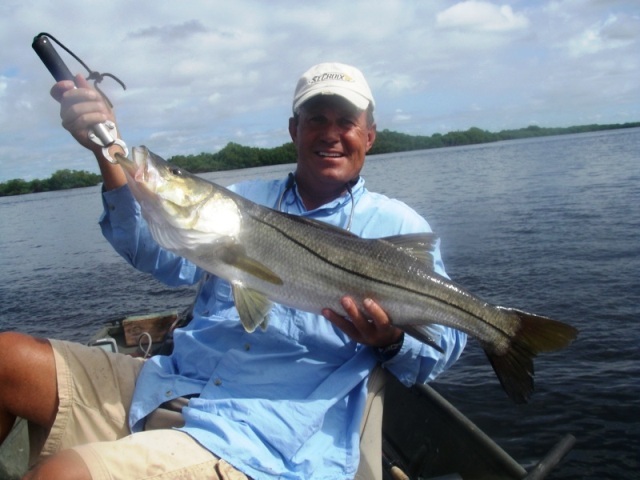 Dave catches a 15 1/2" snook on a rootbeer shrimp near the point in about a foot of water. Nothing else there so we head back over to probe more docks. We come up to an inlet with a point and floating dock. This is where I caught a big snook last time. Dave skips under the floating dock with the chugger and something explodes on his lure, but he doesn't connect. We ease down a little bit and the water erupts all around us. Jacks and other large fish are busting bait on top. At 10:05am, I cast back past the floating dock and am slow-rolling my shadflash by it. I feel a solid strike and set the hook. It is a good fish. The fish is digging and my drag begins to scream. It is a big snook. She goes out and then comes back in towards shore. The fish tries to cut me off on the rocks near the bank, but is unsuccessful. Finally after a tremendous fight all around the boat, Dave is able to slip her into the net. She measures 33 1/4" and weighed 10# 13oz. Dave catches a decent size jack five minutes later on the shad flash. We work more docks on the south side, but have no luck, so we move on. We head across the river and work the west side of Bird Key. We both hook and lose decent trout at this spot. We go under the 75 bridge and see lots of bait and fish activity. I throw my lure near a piling and feel a solid strike. 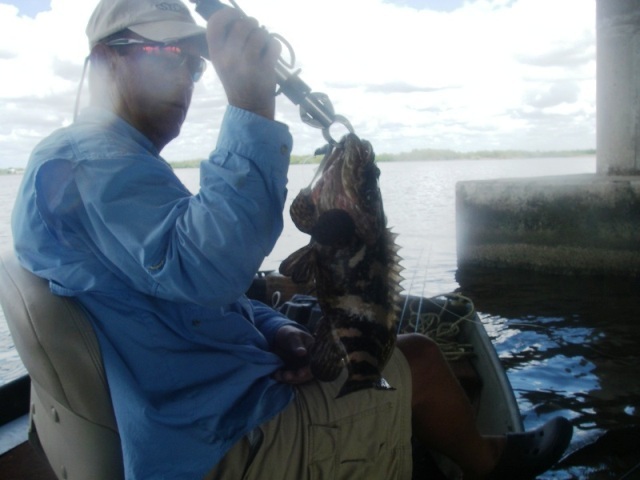 I set the hook and bring in some sort of grouper, my first one, at 12:10pm. No more fish caught there so it is over to the north side of the river and west of the bridge to work docks. 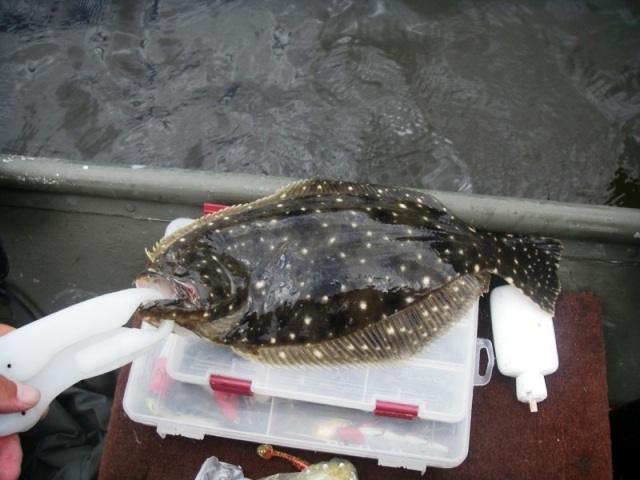 One hour later, I lose a jack near the boat and Dave catches a nice flounder on top on the chugger. At 1:18pm, I catch a 17" trout on the shadflash under a dock. Seven minutes later, Dave catches a 15" trout on the chugger under a dock. We come up on a nice shallow point and I ask Dave if a small rat red is too much to ask for. On that very cast, I get a good strike on my 3" RT mullet in redfish color. It is a redfish that measures 16". Beg and ye' shall receive. We are now working long shallow docks in 3' of water. It is an incoming tide and the current is moving pretty well through this area. At 2:10pm, I skip my 4" shadflash under a dock. Hopping it back and I feel weight. I set the hook and the fish takes off. It is a big fish and she wraps me around a post. I hurry to the dock while the fish is still moving up into shallower water. I can feel my line rubbing against the post. I ease up on the fish as I am sure she is going to break me off. I flip my bail to give her line. I have to stick my rod under the dock and around the post. I close my bail and she is still on but wrapped around a post farther up in shallower water. I move closer to the boat lift and almost break my rods on it. I push off and still feel the fish, but she is still wrapped. I just hold on and wait for her to come back around the other way. Luckliy she does and I am able to gain some line. Now I have to coax her under the boat lift structure and out into open water. I push us off and luckily she swims towards the boat. Finally I have her out in open water. I loosen my drag as I am sure my line is toast, which it was. 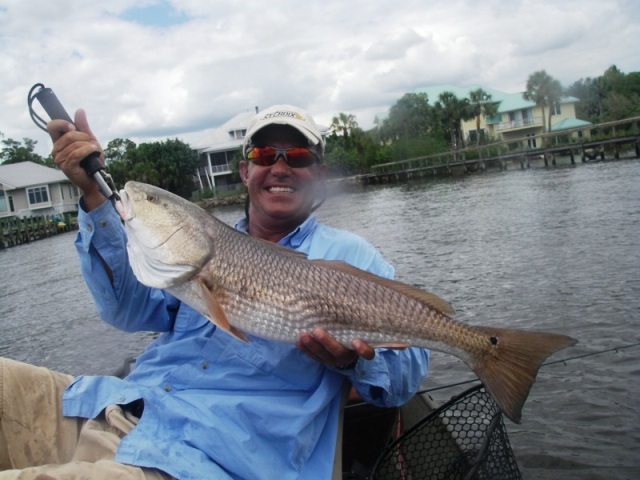 The fish finally surfaces and it is a large redfish. After multiple drag-screaming runs and some heart-pounding action, I am able to get her to the boat. Dave expertly slides the net under her. What an epic battle!!! This fish measures 32" and weighs 11#. I am spent and it takes a while to recover from that fight. We contine to work more long docks in this extremely shallow water. I skip under a dock with the shadflash and have a strike, but can't connect. The tail on my lure is gone. Dave skips under the same dock with the same lure and sets the hook on a decent fish. The fish fights well and he gets it in. He boats his first tripletail at 2:27pm that measures around 16". Very cool! 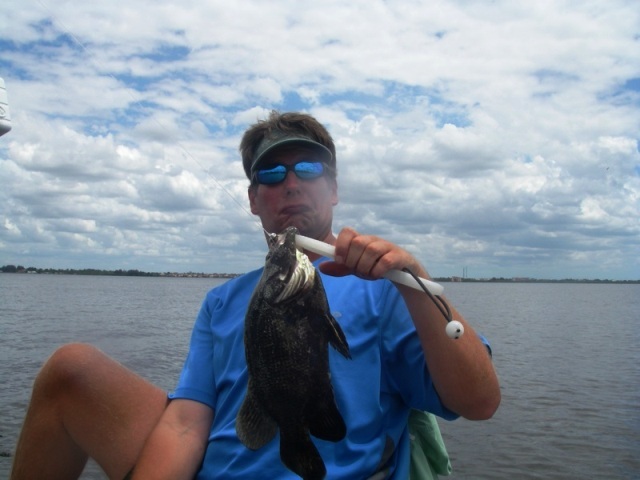 He catches another tripletail that is about the same size under another dock on the shadflash at 2:50pm. By now, I want one of those, but it isn't meant to be. We work more docks in shallow water but current is not moving around these so we head back up to the 75 bridge. We work the 6-8 feet water and I catch two catfish on the shadflash, one which was pretty large and gave me a heck of a fight. We thought it might be a black drum. We move on to work more docks on the north side and east of 75. The wind is really blowing and the tide is moving out. It makes it extremely difficult to work them. At 3:10pm, I catch a 16 3/4" trout on the shadflash. 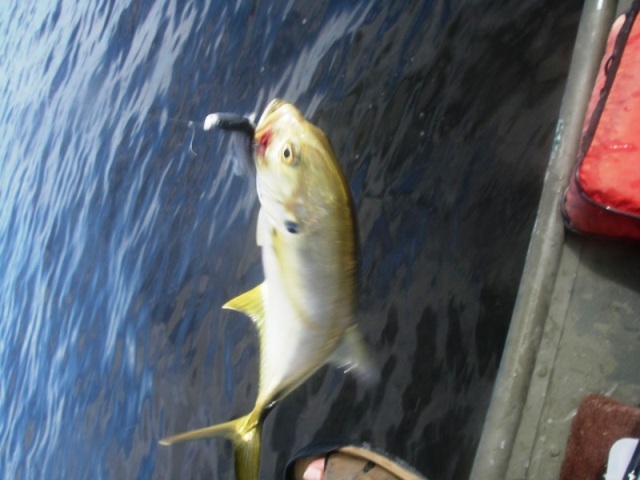 I lose a snook under one dock, but then catch a 17 1/4" snook under a dock on the mullet in smoke/gold halo at 5:15pm. The wind picks up and I cannot maneuver the boat well enough around the docks in order to work them properly. We decide to make a move to get out of the wind and go to the tressle way up river. The water is really flowing under the tressle. The left side is much deeper and I wasn't feeling it. We move over to the right side and it is much shallower. Dave gets a number of blow-ups on the chugger worked under the tressle but can't connect. I get a good strike on the spook, but same result. Finally, bringing the shadflash under and I get a good strike. The fish jumps and spits my lure. I believe it was a small snook. Nothing else there so we head back to work more docks since the wind has died down. No strikes on any docks, which had us dumbfound. Another explosion of jacks all around us, but we can't connect. Getting dark so back towards the point and island near the ramp. We both have a couple of blow-ups on topwater, but can't connect. It is dark and we head for the ramp. The Peace River continues to impress. I was lucky enough to catch two quality fish again. We caught a variety of fish and saw some very cool sights. The fishery down there appears to be extremely healthy and has a lot to offer in terms of areas to fish and the type of fish that can be caught. It has now become one of my favorites. Great report, you guys always seem to do well. Its a baby goliath. Good Job on all the fish!! great report and catching once again! Thanks guys! It was a blast. Actaully Dave also caught the flounder on the topwater chugger. Flounder hitting topwater?! Very cool! PS... Shadflash.. Is that the Culprit Swim Bait, and the color is shadflsh? Yes. It is the Culprit/RipTide Mullet 4" size in the color shadflash. It is a very realistic and effective bait with great tail action.